Missions are attacks no matter how benign the motive. The history of religious missions is replete with complex social, political, economic, and religious conflict. This historical study of how Americans have managed or mismanaged past religiously-influenced conflicts can provide practical wisdom for our time when many social, political, and economic conflicts are strongly influenced by religious factors. We live in local and global societies that are deeply troubled if not torn apart by the perennial problem of religious or ideological conflict between uncompromising rivals that desire mutually exclusive religious and political ends. 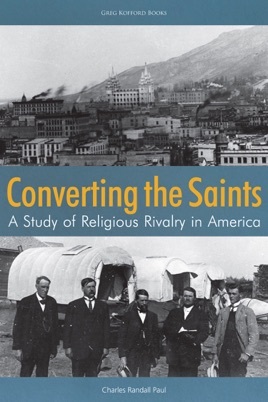 Converting the Saints focuses on American religious history and particularly on the early-twentieth-century Protestant missions to Utah to convert Mormons to traditional Christian belief. After the Mormons acquiesced to federal laws against polygamy and federal pressure to secularize Utah’s governance, the religious conflict over Mormonism’s Christian legitimacy remained unresolved. This was a religious conflict that, in true American style, was engaged as a contest of persuasion held on the figurative battlefield for the human heart. Both rivals understood this, and while unsettled by their mutual opponent’s aggressive criticisms, they did not think it wrong or even strange for their rival to engage them. Centering on the cases of three Protestant missions in Utah, this study explores the crucial understanding at the center of the American experiment: that persuasive contestation over religion, ideology, or founding principles is normal in our secular State, and even healthy for free citizens to flourish within a diverse society.